It’s not often that I rate a contemporary book 5 stars, but Everything Leads to You really did it for me. This book was truly breathtaking and beautiful. It’s such a true betrayal of friendship, love, being true to yourself in such a fun and enchanting way that Nina LaCour handles with such an incredible voice that I found it near impossible to put down. Our main character is Emi. Although growing up in a privileged household, Emi would have to be one of the most down to earth characters I have read about in a long time. Outside of school, Emi spends her time working on movie sets and trying to make a name for herself as a production designer in Hollywood. She is one of the most loyal friends I have come across in contemporary fiction, and I couldn’t help but fall in love with her a little bit over how much she truly cares about everyone and everything she encounters. She is determined to make a name for herself, but I can’t imagine her sacrificing her values for success. Oh, and she is an open lesbian. It was such a nice feeling to read about a young, lesbian teenager who is not afraid to identify herself and where her sexuality is not a major part of the story. Apart from Emi, I really enjoyed all the characters in this book. So much so that I was actually disappointed when some characters were only briefly written into the plot and not given much ‘screen time’. There was such a fun, varied cast of characters in this novel that really added to the reading experience. I found it impossible to be bored when there were such vibrant characters to read about. Besides the film-making aspect of this book, I absolutely loved the mystery. Emi and her best friend Charlotte stumble across a movie star’s inheritance letter, which leads them to a somewhat broken girl, Ava, who is trying her best to figure out who she is. Ava is such a beautiful, mysterious character who was so interesting to read about and she really made the story for me. And as Emi and Ava’s relationship developed over the course of the novel, I found myself swooning a little over the slow-burning romance that LaCour tackled. I couldn’t help but love how natural she made everything feel. 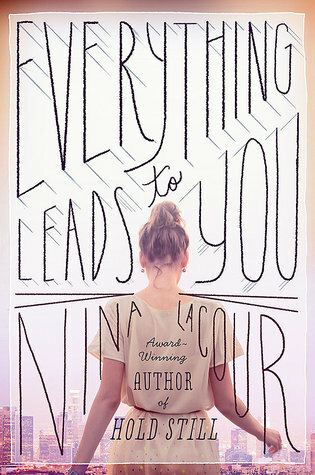 Everything Leads to You is the first book I have read by Nina LaCour, but I can already tell it won’t be the last. It was written so poetically and was paced perfectly. It was such an honest portrayal of growing up and dealt with LGBT+ topics in a beautifully honest way that teaches you to be yourself selflessly. I cannot express how much I adored this book, and it’s definitely made my favourites list. I will recommend this to everyone!